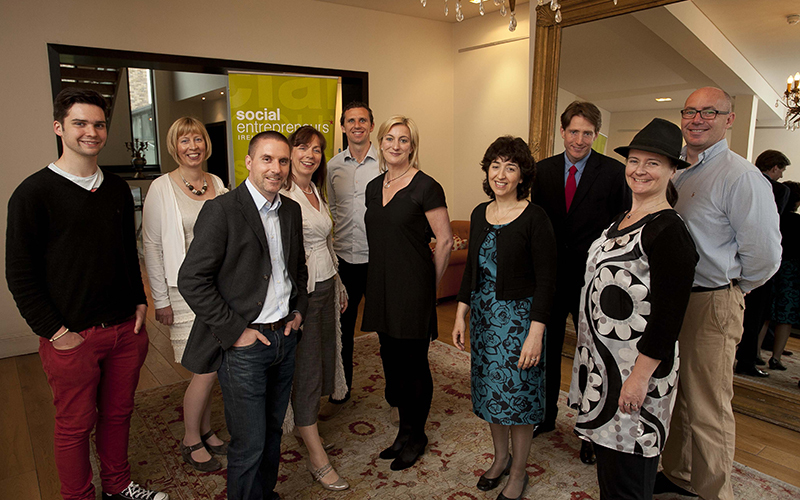 The eight finalists in the 2012 Social Entrepreneurs Ireland Awards have been announced. The finalists are George Boyle of Fumbally Exchange, Lucy Masterson of Hireland, James Whelton of Coder Dojo, Trevor White of City of a Thousand Welcomes, Aviva Cohen of Neuro Hero, Emma Murphy of The Turning Institute, Rachel Cassen of LEAP and Tony Griffin and Karl Swan of Soar Foundation. Each of the eight social entrepreneurs head young organisations with innovative ideas for major social change in Ireland in areas as diverse as employment, eating disorders, computer coding for children and supporting families of people with disabilities. The finalists will spend the next three months vying with each other for a major share in the €775,000 prize fund with the ultimate winners announced at Social Entrepreneurs Ireland’s annual awards ceremony in October. Three of the finalists will be chosen to participate in Social Entrepreneurs Ireland’s Impact Programme and will benefit from a support package of €200,000 each. The five runner’s up will participate in Social Entrepreneurs Ireland’s Elevator Programme which is valued at €35,000 each. The Awards Programmes are generously supported by DCC plc and will help emerging social entrepreneurs develop their initiatives so that they have a big impact in Ireland by effecting real social change. The shortlisted social entrepreneurs epitomise the spirit of the Irish people, who are stepping up and taking action to make Ireland a better place. The 2012 finalists have been chosen from nearly 200 applicants. Kickstarting a burst of job creation in Ireland – one job at a time. Hireland is addressing the issue of unemployment in Ireland by encouraging small and medium enterprises around the country to pledge to hire one additional staff member. Hireland challenges people to think about what they can do to improve their business by hiring, and change the mindset around the country from one of firing to one of hiring. Started by Lucy with her neighbours around the kitchen table last year, she aims to fuel a positive momentum and send a positive message throughout communities that recovery can and will happen one job at a time. An Irish-led global movement of free coding clubs for young people. Coder Dojo addresses the gap in the education system around computer literacy and coding. For young people who are interested in developing their coding skills there is no forum for them currently to do so. The technology and skill sets move so quickly that it would be hard for schools to deliver this education successfully. Coder Dojo is an Irish led, global network of free not-for-profit computer clubs where young people learn to code and develop websites, apps, games and more. It is taught by professionals who volunteer their time and is entirely free. It also provides laptops for children who do not have them wherever possible and also reaches out to remote locations. Online programmes for adults with eating disorders. The Turning Institute provides therapist designed and clinically proven online programmes for adults with eating disorders. Emma Murphy is a psychotherapist specialising in eating disorders, and has run a group for people affected by eating disorders for over 3 years. Building on the content from this programme, Emma has developed an online platform that is both relevant and effective at bringing about change. The online programmes provide a first step towards recovery that can be worked through in complete confidence. In addition, The Turning Institute are currently collaborating with Bodywhys, the Irish National Eating Disorders Association, to deliver online training for GPs in correctly identifying, diagnosing and treating patients with eating disorders. Empowering families experiencing disability to create self-directed, empowered lives. LEAP provides leadership, mentoring and training solutions to families who have a child with a disability and who wish to take control of their own support needs. This helps families create solutions that will ensure children with disabilities maintain strong and diverse relationships with family members, friends and community. LEAP partners with families to develop a personalised support roadmap without imposing its own goals or solutions. LEAP mentors families enabling them to self-direct and self-manage their own funding and support initiatives. Technology based supports for people with communication difficulties. For people who have suffered reduced communication ability due to impairments such as brain injury or intellectual disability, the inability to communicate can lead to feelings of isolation and depression. To tackle this social isolation, Aviva Cohen has created Neuro Hero, a home based, family support package that uses a series of innovative web apps for mobile devices and PCs. Neuro Hero will provide a subscription based support package which will include therapeutic activities, communication activities, training videos, carer support tools and educational materials. Promoting Dublin as a place of outstanding hospitality and civic pride. In this time of economic hardship it can be difficult for people to remember what is unique and positive about Ireland. Despite the downturn, 93% of tourists still say that the most memorable aspect of their trip is the friendliness of the people. Building on this, Trevor White has developed a unique activity which allows Dubliners to sign up as volunteer “ambassadors” and bring visitors to the city for a free pint or cup of tea. The service is completely secure and free for both visitor and volunteer. This encourages civic pride and encourages visitors to come to the city by sending a positive message about Dublin out to the rest of the world – it is the only city in the world where the locals are literally queuing up to meet you! Affordable, flexible and collaborative workspaces for creative and design-focused professionals. Fumbally Exchange (FEx) is a creative movement that is transforming working practices, stimulating recovery and driving innovation in enterprise. Founded by architect George Boyle in the heart of Dublin’s Liberties in 2010, FEx inspires experienced professionals to grow or start new business in the fields of design and innovation. FEx provides creative workspaces in key locations and sectors, and runs mentoring, workshops, exhibitions, apprenticeships and other programmes. This allows creative and innovative professionals to focus on the opportunities around them and make work, together. Providing positive life-skills for young people to develop self-belief and to fulfil their potential. Soar creates and delivers innovative programmes for young people where, within a safe and supportive environment, they are given the opportunity to share and learn, build self-confidence and increase their emotional awareness. Soar invests in young people by equipping them with positive life skills to fulfil their potential. Soar is for all young people regardless of their background and acts as an early intervention initiative. Soar was founded by former Clare hurler Tony Griffin and Karl Swan, who were inspired by the success of Reach in Australia, which has been running a similar programme with young people there for the last 17 years.